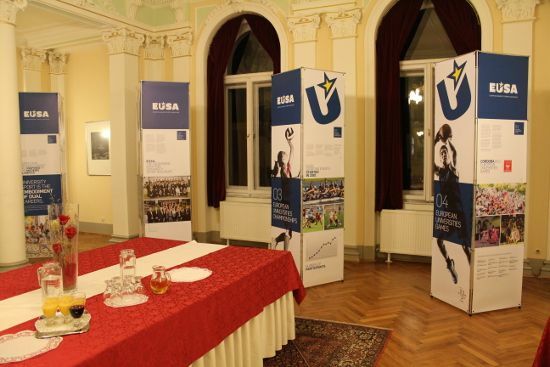 European University Sports Association (EUSA) launched an Exhibition on University Sport in Europe in 2014. The project, supported by the International University Sport Federation (FISU), enables an overview of the development of university sport, with a special focus on European context.In Europe, sport movement covering the field of higher education and involving university and college students has a strong and long tradition. Already a Latin aphorism “Mens sana in corpore sano” illustrates the importance of sound and healthy body and the mind. The exhibition features seven standalone panels in form of towers, grouping the contents according to topics: University sport in Europe; European University Sports Association; European Universities Championships; European Universities Games; Education, social responsibility & partnerships; Honouring the best. The exhibition was officially launched and opened during the European Universities Games Rotterdam 2014 in July and August 2014, hosted at the premises of the Erasmus University Rotterdam. In 2015, the exhibition has been hosted in Slovenia (Koper), Italy (Trieste), Croatia (Rijeka and Zagreb), Lithuania (Kaunas), Switzerland (St. Gallen, Basel and Zurich) and also during the FISU events – Universiade in Gwangju, Korea and Assembly in Lausanne, Switzerland. It will travel to other European countries and universities also in the future. 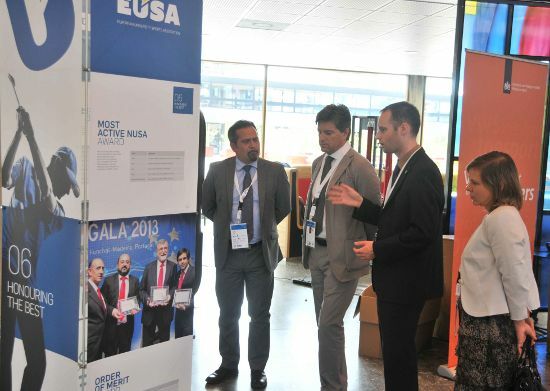 EUSA exhibition is a travelling exhibition and can be also requested for display at universities, university sports events and at other occasions in Europe. Please contact the EUSA Office if you are interested in hosting the exhibition.